Describe a simple method to verify if an electrochemical reaction is limited by a concentration polarization effect. 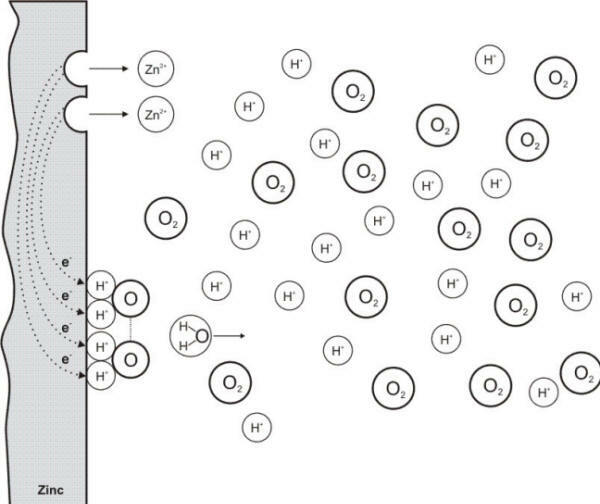 A frequent case of concentration polarization occurs when the cathodic processes depend on the reduction of dissolved oxygen since it is usually in low concentration, i.e. in parts per million (ppm). 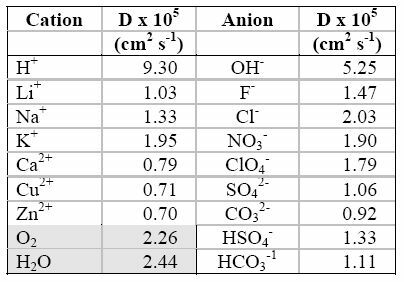 The following Tables contain respectively data related to the solubility of oxygen in air saturated water at different temperatures and data on the solubility of oxygen in seawater of different salinity, chlorinity, and temperatures. In both Tables, the level of dissolved oxygen is seen to increase as the temperature decreases. How many grams of dissolved oxygen are present in one liter of aerated water at 5ºC? ... at at 30ºC? Describe a simple method to reduce the quantity of dissolved oxygen in a water container or vessel. 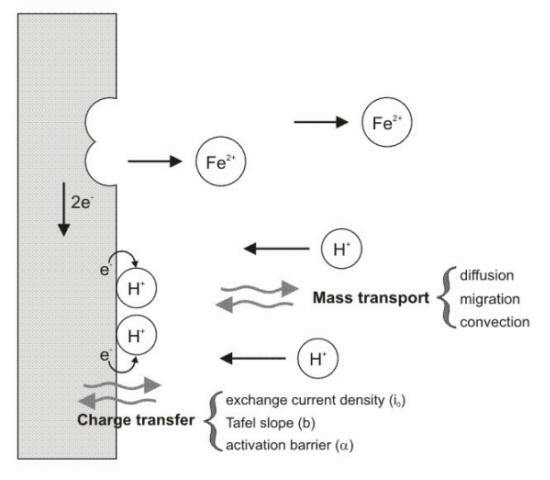 As illustrated in the following Figure, mass transport to a surface is governed by three forces, i.e diffusion, migration and convection. In the absence of an electrical field, the migration term, that only affects charged ionic species, is negligible while the convection force disappears in stagnant conditions. dx is the thickness of the interface (cm). where A is a constant for the system. The following Figure illustrates the concentration-distance profile at the electrode surface approximated by a simple gradient. In this diagram the metallic surface is positioned at the ordinate axis while the x-axis expresses the distance away from the electrode and the y-axis the concentration of the chemical species being reacted. 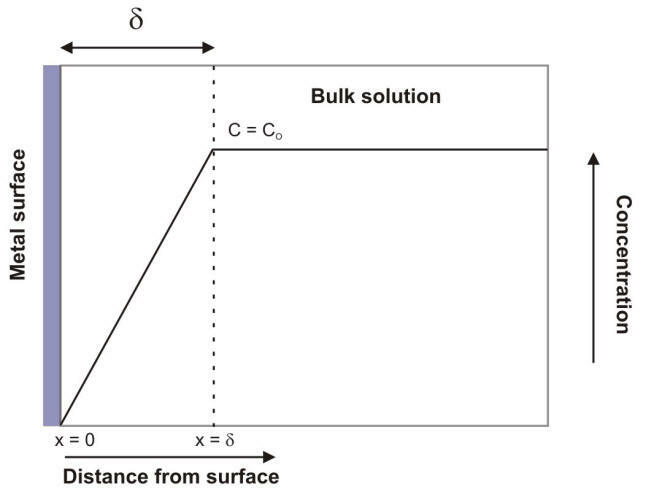 For well mixed solutions, the concentration is constant in the bulk or convective region. This is represented by the horizontal line where C = CO. There is also a region where the concentration drops, falling to zero at the electrode surface. The Nernst diffusion layer, also called the diffuse layer, associated with this drop has a specific thickness (d) that depends upon the nature of the solution into which it extends. For stirred aqueous solutions the thickness of the diffuse layer varies between 0.01 and 0.001 mm. where 2.303·R·T/F = 0.059 V when T = 298.16 K.